For earlier spacewalks, see List of spacewalks and moonwalks 1965–1999. For later spacewalks, see List of spacewalks since 2015. Nicholas Patrick and Robert Behnken in the first EVA of the STS-130 mission on February 12, 2010. This list contains all spacewalks performed between 12 May 2000 and 22 October 2014 where an astronaut fully or partially left a spacecraft. Spacewalk beginning and ending times are given in Coordinated Universal Time (UTC). Kaleri and Zalyotin tested a leak sealant and inspected a malfunctioning solar panel on Kvant-1. A final photographic record of the outer surfaces of Mir was made during a panoramic inspection. Voss and Williams inspected and secured a U.S.-built cargo crane known as the Orbital Replacement Unit Transfer Device, completed assembly of a Russian cargo crane called Strela, and replaced one of Unity's two early communication antennas. Lu and Malenchenko attached cabling that fully integrated the Zvezda module to the rest of the ISS, and constructed and attached a magnetometer that serves as a backup navigation system for the station. Chiao and McArthur connected two sets of cables to provide power to heaters and conduits located on the Z1 truss, relocated two communication antenna assemblies, and installed a toolbox for use during future on-orbit construction. Lopez-Alegria and Wisoff installed the Pressurized Mating Adapter (PMA)-3 docking port, and prepared the Z1 truss for the installation of the solar arrays. Chiao and McArthur installed two DC-to-DC converter units atop the station's Z1 truss. They also reconfigured cabling to new docking port PMA-3, and installed a tool storage box on the Z1 truss. Lopez-Alegria and Wisoff removed a grapple fixture on the Z1 truss, deployed a Z1 utility tray, Manual Berthing Mechanism latches for Z1 were cycled and opened, and demonstrated the SAFER pack's abilities. Tanner and Noriega attached the P6 truss to the Z1 truss and prepared the solar arrays for deployment. They also prepared the radiator for the power system deployment. Tanner and Noriega configured the station to use power from the P6 truss solar array and positioned the S-band antenna for use by the station. They also prepared the station for the arrival of the U.S. laboratory, Destiny. Tanner and Noriega positioned a floating potential probe to measure the plasma field surrounding the station, performed repair work to increase tension in the starboard solar array blankets that did not stretch out completely during deployment, and installed a centerline camera cable outside the Unity node. Robert Curbeam on an EVA to install the Destiny science module onto the ISS during STS-98. Jones and Curbeam removed protective launch covers and disconnected power and cooling cables between Destiny and Atlantis, while crewmembers inside the shuttle moved the 3,800-cubic-foot (110 m3) laboratory from the payload bay to its home on the Unity node. Curbeam and Jones then connected electrical, data and cooling lines to the lab, during which a small amount of ammonia crystals leaked from one of the hoses, prompting a decontamination procedure. Jones and Curbeam installed the shuttle docking adapter onto Destiny, installed insulating covers over the pins that held Destiny in place during launch, attached a vent to the lab's air system, installed handrails and sockets on the exterior of Destiny, and attached a base for Canadarm2. Jones and Curbeam attached a spare communications antenna to the station's exterior, double-checked connections between the Destiny lab and its docking port, released the restraints on a station cooling radiator, inspected solar array connections at the top of the station, and tested a technique for a spacewalker to carry an incapacitated crew member to the shuttle airlock. This was the 100th U.S. spacewalk. Voss and Helms prepared Pressurized Mating Adapter-3 for repositioning from Unity’s Earth-facing berth to the port-side berth to make room for Leonardo, the Italian Space Agency-built Multi-Purpose Logistics Module. They also removed a Lab Cradle Assembly from Discovery's payload bay and installed it on the side of Destiny, and installed a cable tray to Destiny for later use by the station's robot arm (Canadarm2). After re-entering the shuttle's airlock, Voss and Helms remained ready to assist if any troubles installing the docking port were encountered by the crew inside the shuttle. This was the longest space walk in shuttle history. Thomas and Richards installed an External Stowage Platform for spare station parts, attached a spare ammonia coolant pump to the platform, and finished connecting several cables put in place on the first EVA for the station's robotic arm. They also inspected a Unity node heater connection, and inspected an exterior experiment, the Floating Potential Probe. Hadfield and Parazynski installed the station's UHF antenna, and the Canadian Space Agency-made Canadarm2. They connected cables to give the arm power and allow it to accept computer commands from inside the Destiny lab. Hadfield became the first Canadian spacewalker. Hadfield and Parazynski connected the Power Data Grapple Fixture circuits for Canadarm2 onto Destiny, removed an early communications antenna, transferred a spare Direct Current Switching Unit from Atlantis's payload bay to an equipment storage rack on the outside of Destiny. Usachev and Voss installed the docking cone onto the Zarya module, in preparation for the arrival of the Russian Pirs docking compartment. To date, this is the only EVA to be conducted from the transfer compartment at the forward end of the Zvezda Service Module. Gernhardt and Reilly installed the Quest Joint Airlock onto the Unity node and connected power cables to it. Gernhardt and Reilly installed one of two high-pressure nitrogen tanks, and one of two high-pressure oxygen tanks onto Quest, and installed grapple fixture and trunnion covers. This was the first EVA conducted from the Quest airlock. Gernhardt and Reilly installed the second high-pressure nitrogen tank, and the second oxygen tank onto the Quest airlock. After completion of the tank installation, Gernhardt and Reilly conducted a photography session around the new airlock. Barry and Forrester installed an Early Ammonia Servicer onto the station's P6 truss, stowed a foot restraint, and installed the Materials International Space Station Experiment (MISSE)-1 and 2 containers onto the Quest airlock. Barry and Forrester installed heater cables and handrails onto the station's Destiny laboratory. Dezhurov and Tyurin installed cables between the Pirs module and the Zvezda module to allow spacewalk radio communications between the two sections. The cosmonauts installed handrails onto Pirs, and installed an exterior ladder to assist spacewalkers leaving Pirs. They also installed a Strela cargo crane. Dezhurov and Tyurin installed Russian commercial experiments (MPAC-SEEDS) onto the exterior of the Pirs docking compartment. Dezhurov and Culbertson connected cables on the exterior of Pirs for the Kurs automated docking system, completed checks of the Strela cargo crane, and inspected and photographed a panel of a solar array on Zvezda that had a portion of a panel not fully unfolded. Dezhurov and Tyurin removed an obstruction that prevented a Progress resupply ship from firmly docking with the station, and took pictures of the debris and of the docking interface. Godwin and Tani installed insulating blankets around two Beta Gimbal Assemblies that rotate the station's solar array wings, and performed tasks in preparation for STS-110's spacewalks. Onufriyenko and Walz moved the cargo boom for the Russian Strela crane from PMA-1 to the exterior of the Pirs docking compartment and installed an amateur radio antenna onto the end of Zvezda. Onufriyenko and Bursch installed six deflector shields for Zvezda's jet thrusters, installed a second amateur radio antenna, attached four science experiments, and retrieved and replaced a device to measure material from the thrusters. Walz and Bursch tested the Quest airlock, and prepared it for the four spacewalks to be performed during STS-110. This was the first spacewalk to be based out of Quest without a Space Shuttle docked at the station. Grunsfeld and Linnehan removed the old starboard solar array on the Hubble Space Telescope and replaced it with a new, smaller and more powerful third generation solar array. The old array was stowed in Columbia's payload bay for return to Earth. Newman and Massimino removed the old port solar array on the Hubble Space Telescope and replaced it with a new third generation solar array. The old array was stowed in Columbia's payload bay for return to Earth. The two astronauts then removed and replaced the Reaction Wheel Assembly (RWA). The spacewalk was delayed two hours by a water leak in Grunsfeld's spacesuit. The old Power Control Unit (PCU) was removed from Hubble and stowed for return to Earth. A new, more powerful PCU, sized to match the more productive solar arrays, was installed. Newman and Massimino removed the Faint Object Camera from the aft shroud of Hubble and installed the Advanced Camera for Surveys (ACS) in the same location. After stowing the Faint Object Camera in Columbia for return to Earth, the Electronic Support Module was installed in the aft shroud. Linnehan and Grunsfeld installed an experimental cryocooler for NICMOS inside the aft shroud of Hubble and connected it to the Electronic Support Module installed the day before. Then the two spacewalkers installed the Cooling System Radiator to the outside of Hubble, and connected it to the NICMOS. Smith and Walheim began installing the S0 truss onto Destiny by setting up initial power and data connections between the station and the truss, and installing two forward struts that permanently held the truss in place. Ross and Morin continued the installation of the S0 truss, installing power and data cable connections between the truss and the station, and two aft struts that permanently held the truss in place. Smith and Walheim released the claw that was used in the initial attachment of the S0 truss, installed connectors used to route power to Canadarm2 when it is on the truss, released launch restraints from the Mobile Transporter, and removed a small thermal cover the Mobile Transporter's radiator. Ross and Morin pivoted the "Airlock Spur", which is currently used by spacewalkers as a path from the Quest airlock to the truss, installed handrails onto S0, partially assembled a platform, and installed two floodlights. Chang-Diaz and Perrin attached a Power Data Grapple Fixture to the P6 truss, removed debris panels from Endeavour's payload bay and attached them to a temporary location on PMA-1, and removed thermal blankets to prepare the Mobile Base System (MBS) for installation onto the station's Mobile Transporter. Chang-Diaz and Perrin attached the Mobile Base System to the Mobile Transporter, and attached power, data and video cables from the station to the MBS. Chang-Diaz and Perrin replaced Canadarm2's wrist roll joint, and stowed the old joint in Endeavour's payload bay to be returned to Earth. Korzun and Whitson installed six micrometeoroid debris panels onto Zvezda. These panels were the first six of 23 panels that were installed to add more micrometeoroid protection to Zvezda. Korzun and Treshchev installed a frame on the outside of Zarya for spacewalk assembly tasks, installed new samples on a pair of Japanese Space Agency experiments housed on Zvezda, installed devices on Zvezda that would simplify the routing of tethers during future spacewalks, and installed two additional amateur radio antennas on Zvezda. Wolf and Sellers released launch locks that held the S1 truss radiators in place during launch, attached power, data and fluid lines between the S1 truss and S0 truss, deployed the station's second S-Band communications system, installed the first of two external camera systems, and released launch restraints on the truss's mobile spacewalk workstation, the Crew and Equipment Translation Aid (CETA). Wolf and Sellers installed a second camera system, released more radiator launch locks, removed insulation covers on quick-disconnect fittings near the Z1 and P6 junction, installed Spool Positioning Devices, released starboard-side launch restraints on the CETA cart, and attached Ammonia Tank Assembly cables. Wolf and Sellers removed and replaced the Interface Umbilical Assembly on the station's Mobile Transporter, installed two jumpers allowing for ammonia coolant to flow between the S1 and S0 trusses, released a drag link and stowed it, and installed Spool Positioning Devices (SPD) on ammonia lines. Lopez-Alegria and Herrington began the initial installation of the P1 truss by installing connections between the P1 and the S0 truss, releasing launch restraints on the CETA cart, installing Spool Positioning Devices (SPDs) onto the station, and removing a drag link on P1 that served as a launch restraint. They also installed a wireless video system External Transceiver Assembly onto the Unity node. Lopez-Alegria and Herrington installed fluid jumpers where the S0 and the P1 are attached to each other, removed the P1's starboard keel pin, installed another wireless video system External Transceiver Assembly onto the P1, and relocated the CETA cart from the P1 to the S1 truss. Bowersox and Pettit released the remaining launch locks on the P1 radiator assembly, removed debris on a sealing ring of Unity's docking port, and tested an ammonia reservoir on the station's P6 truss. Bowersox and Pettit reconfigured cables on the S0, S1 and P1 trusses, replaced a Power Control Module on the Mobile Transporter, installed Spool Positioning Devices on Destiny, and reinstalled a thermal cover on an S1 Radiator Beam Valve Module. Foale and Kaleri replaced cassette containers that held sample materials for a microgravity experiment, attached the Russian experiment Matryoshka to Zvezda, and removed a JAXA micrometeoroid impact experiment. The spacewalk was cut short due to a cooling system malfunction in Kaleri's spacesuit. The spacewalk cut short due to a pressure problem in Fincke's prime oxygen tank in his spacesuit. Mission managers decided to reschedule the spacewalk for 30 June. Padalka and Fincke replaced a Remote Power Controller (RPC) that failed in late April, causing a loss of power in Control Moment Gyroscope 2 (CMG 2). This spacewalk was the first time that primary Mission Control was transitioned from Moscow to Houston during an EVA. Padalka and Fincke removed laser retro reflectors from the Zvezda assembly compartment, and installed three updated laser retro reflectors and one internal videometer target in preparation for the Automated Transfer Vehicle (ATV). They also installed two antennas, and removed and replaced Kromka experiment packages. Padalka and Fincke continued preparations for the arrival of the European Space Agency's Automatic Transfer Vehicle. They replaced the Zarya Control Module flow control panel, installed four safety tether fairleads on Zarya's handrails, installed three communications antennas, and removed covers from the antennas. Noguchi and Robinson demonstrated shuttle thermal protection repair techniques and enhancements to the Station's attitude control system. They also installed a base and cabling for an External Stowage Platform, rerouted power to Control Moment Gyroscope-2 (CMG-2), retrieved two exposure experiments, and replaced a faulty global positioning system antenna on the station. Noguchi and Robinson removed a faulty CMG-1 from the Z1 truss, installed the faulty CMG-1 into Discovery's payload bay, and installed a new CMG-1 on the Z1 truss segment. McArthur and Tokarev released SuitSat-1, retrieved the Biorisk experiment, photographed a sensor for a micrometeoroid experiment, relocated an adapter for a small crane, and tied off the surviving umbilical of the Mobile Transporter. Sellers and Foale installed a blade blocker in the zenith Interface Umbilical Assembly (IUA) to protect the undamaged power, data and video cable, and rerouted the cable to prepare for the second EVA. They also tested the combination of the Shuttle's Canadarm(SRMS) and the Orbiter Boom Sensor System (OBSS) as a platform for astronauts to make repairs to a damaged orbiter. Sellers and Fossum restored the International Space Station's Mobile Transporter rail car to full operation, and delivered a spare pump module for the station's cooling system. Sellers' SAFER pack came loose during the EVA, requiring Fossum to stop twice during the spacewalk to secure the pack with safety tethers. Sellers and Fossum used an infrared camera to shoot 20 seconds of video of selected reinforced carbon-carbon (RCC) panels on the shuttle wing's leading edge, and then moved to the payload bay to test a shuttle tile repair material known as NOAX on pre-damaged shuttle tiles that were flown in a test container. Tanner and Stefanyshyn-Piper installed a radiator onto the P3/4 truss, powered up a cooling radiator for the new solar arrays, replaced an S-Band radio antenna, and installed insulation for another antenna. Tanner took photos of the shuttle's wings using an infrared camera to test the camera's ability to detect damage. An unusual "Orbiting golf shot" event was sponsored by a Canadian golf company through the Russian Federal Space Agency. López-Alegría put the tee on the ladder outside Pirs, while Tyurin set up a camera and performed the golf shot. López-Alegría and Tyurin inspected and photographed a Kurs antenna on Progress 23, relocated an Automated Transfer Vehicle (ATV) WAL antenna, installed a BTN neutron experiment, and jettisoned two thermal covers from the BTN. Curbeam and Fuglesang reconfigured the station's electrical wiring, placing electrical channels 2–3 on the P3/P4 truss into service, thus enabling full advantage of the new solar arrays. They then relocated two handcarts that run along rails on the station's main truss, put a thermal cover on the station's robotic arm, and installed tool bags for future spacewalkers. Curbeam and Williams completed rewiring the station's electrical system, activating electrical circuits 1 and 4, preparing for installation of more solar power arrays. They then installed a robotic arm grapple fixture, and positioned three bundles of Russian debris shield panels outside Zvezda. Additional time was spent trying to help retract the P6 solar array panel by shaking the panel's blanket box from its base. López-Alegría and Williams reconfigured one of the two cooling loops serving Destiny from the temporary to permanent system, connected a cable for the Station-to-Shuttle Power Transfer System (SSPTS), installed six cable cinches and two winch bars to secure the starboard radiator of the P6 Truss, and then installed a shroud over it. They then removed one of two fluid lines from the Early Ammonia Servicer (EAS) on the P6 Truss in preparation for jettisoning the EAS on a later EVA. López-Alegría and Williams reconfigured the second of the two cooling loops serving Destiny from the temporary to permanent system, completed work with the Early Ammonia Servicer (EAS) on the P6 Truss, photographed the inboard end of the P6 starboard solar wing in preparation for its retraction during STS-117, removed a sunshade from a multiplexer-demultiplexer data relay device, and continued work on the SSPTS. López-Alegría and Tyurin retracted the antenna of the Progress cargo carrier at the aft port of the Zvezda service module, photographed a Russian satellite navigation antenna, and replaced a Russian materials experiment. They also inspected and photographed an antenna for the Automated Transfer Vehicle (ATV), photographed a German robotics experiment, and inspected, remated, and photographed hardware connectors. Tyurin experienced some cooling problems and fogging on his visor during the spacewalk. Kotov and Yurchikhin installed a section of Ethernet cable on the Zarya module, installed additional Service Module Debris Protection (SMDP) panels on Zvezda, and deployed a Russian scientific experiment. Forrester and Swanson retrieved a television camera and its support structure from an External Stowage Platform attached to the Quest airlock, and installed it on the S3 truss, verified the Drive Lock Assembly (DLA) 2 configuration, and removed the last six SARJ launch restraints. Then they installed a computer network cable on the Unity node, opened the hydrogen vent valve on the Destiny laboratory, and tethered two orbital debris shield panels on the station's service module. Mastracchio and Williams attached the Starboard 5 (S5) segment of the station's truss, and retracted the forward heat-rejecting radiator from the station's Port 6 (P6) truss in preparation for moving the P6 truss to its final location at the end of the port truss. Whitson and Malenchenko disconnected and stored the Station-to-Shuttle Power Transfer System cables, stored the PMA-2 umbilical, and stowed a Harmony node avionics umbilical into a temporary position. Whitson and Tani inspected the S4 starboard Solar Alpha Rotary Joint (SARJ), and a Beta Gimbal Assembly (BGA). This EVA was the 100th in support of building the International Space Station. Records: 100th EVA in support of assembly and maintenance of the International Space Station. Walheim and Love installed a grapple fixture on Columbus while it was still in the shuttle's payload bay, prepared electrical and data connections on Columbus, and replaced the P1 truss nitrogen (N2) tank used for pressurizing the station's ammonia cooling system. Linnehan and Behnken completed the assembly of Dextre. The spacewalkers also installed spare equipment for the station onto an external stowage platform (ESP) on the Quest airlock, including a yaw joint for the station's robotic arm, Canadarm2, and two spare direct current switching units. Their attempt to attach the MISSE 6 experiment onto the Columbus module was unsuccessful as the latching pins failed to engage. Garan and Fossum released the straps on the shuttle's robotic arm elbow joint camera, transferred the OBSS back to the shuttle, and repaired the Japanese Experiment Module, Pressurized Module (JEM-PM), named Kibo, for installation. They also replaced a trundle bearing assembly on the starboard Solar Alpha Rotary Joint, and inspected damage on the SARJ. EVA 2 Ronald J. Garan, Jr.
Garan and Fossum installed covers and external television equipment on the JEM, prepared the RMS, prepared for the relocation of the ELM-PS, prepared a depleted nitrogen tank assembly for removal, and prepared a new one stowed on an external stowage platform for installation. They also removed a television camera with a failed power supply. EVA 3 Ronald J. Garan, Jr.
Stefanyshyn-Piper and Bowen transferred an empty nitrogen tank assembly from ESP3 to the shuttle's cargo bay, transferred a new flex hose rotary coupler to ESP3 for future use, removed an insulation cover on the Kibo External Facility berthing mechanism, began cleaning and lubrication of the starboard SARJ, and replaced its 11 trundle bearing assemblies. Stefanyshyn-Piper and Kimbrough relocated the two Crew and Equipment Translation Aid (CETA) carts from the starboard side of the Mobile Transporter to the port side, lubricated the station robotic arm's latching end effector A snare bearings, and continued cleaning and lubrication of the starboard SARJ. Lonchakov and Fincke installed the electromagnetic energy measuring device, (Langmuir probe) on Pirs, removed the Russian Biorisk long-duration experiment, installed the Expose-R experiment package on Zvezda, and installed the Impulse experiment. Swanson and Acaba prepared a worksite for STS-127, installed an unpressurized cargo carrier attachment system on the P3 truss, installed of a Global Positioning System antenna to the Kibo laboratory, and took infrared images of panels of the radiators on the P1 and S1 trusses. Removed COSTAR corrective optics package and installed Cosmic Origins Spectrograph. Repaired Advanced Camera for Surveys including get-ahead by completing steps from EVA-5. Repaired Space Telescope Imaging Spectrograph. Prepared the Zvezda service module transfer compartment for the arrival of the Mini-Research Module 2, installed docking antenna for the module, photographed antenna for evaluation on the ground, and photographed the Strela-2 crane. JEF installed and P3 Nadir UCCAS deployed. S3 Zenith Outboard PAS deploy postponed due to time constraints. Prepared for the replacement of an empty ammonia tank on the station's port truss by releasing its bolts. Retrieved the Materials International Space Station Experiment and European Technology Exposure Facility mounted outside the Columbus laboratory, and stowed them in Discovery's cargo bay for their return to Earth. Removed the new ammonia tank from the shuttle's payload bay and replaced it with the used tank from the station. The new tank, weighing about 1,800 pounds (820 kg), was the most mass ever moved by spacewalking astronauts. Preparations for the arrival of the Tranquility node by attaching cables between the starboard truss and the Unity node, the area where Tranquility will be installed. Tranquility is targeted to arrive on STS-130 in February 2010. The spacewalkers also replaced a communications sensor device, installed two new GPS antennas, and replaced a circuit breaker. Installed a spare antenna on the station's truss and a bracket for ammonia lines on the Unity module. Lubricated the grapple mechanism on the Payload Orbital Replacement Unit Attachment Device on the Mobile Base System and lubricated the snares of the hand of the station's Japanese robotic arm. Deployed the S3 outboard Payload Attach System. Installed new High Pressure Gas Tank (HPGT) on Quest airlock. Installed MISSE-7A and 7B on ELC-2. Strapped two micrometeoroid and orbital debris (MMOD) shields to External Stowage Platform #2. Relocated foot restraint, released a bolt on Ammonia Tank Assembly, installed insulated covers on cameras on mobile servicing system and Canadarm 2's end effector. Worked heater cables on docking adapter. Removed a protective cover on a port on the Unity node where Tranquility was berthed halfway through the spacewalk. Transferred a spare parts platform for the Special Purpose Dexterous Manipulator from the shuttle to the station. Made several connections on the newly installed Tranquility node to begin its activation. The fluid lines were connected to the new ammonia tank and the old tank was moved to the shuttle's payload bay for return to Earth. Micro-meteoroid debris shields from the Quest airlock which were no longer necessary were brought inside the airlock for return to Earth inside the Leonardo MPLM. The Z1 truss was prepared for the installation of a spare antenna on the next shuttle mission, and a foot restraint was relocated in preparation for a future spacewalk. The retrieval of an external carrier plate on Columbus was deferred to another shuttle mission due to time constraints after problems were encountered with attaching the old ammonia tank to a carrier in the payload bay, and several other tasks were deferred to later EVAs due to the replanning from the problems with the mission's second EVA. Repaired Atlantis' Orbiter Boom Sensor System (OBSS); P6 battery replacement (4 of 6 units); and removed gimbal locks from the Ku-band antenna installed on the first EVA of the mission. P6 battery replacement (final 2 of 6 units); installed ammonia "jumpers" at the P4/P5 interface; retrieved a spare PDGF from Atlantis' payload bay and stowed it inside the Quest airlock. The spacewalkers also replenished supplies of EVA tools in toolboxes on the exterior of the station. Prepared Rassvet module to allow future Russian vehicles to dock using Kurs automated rendezvous system capability. Routed and mated command and data handling cables on Zvezda and Zarya modules. Installed: portable multipurpose workstation in Zvezda Plane IV; struts between Poisk and Zvezda and Zarya modules; hand-rail on Pirs docking module; SKK #1-M2 cassette on Poisk module. Removed: Plasma Pulse Injector Science hardware and Expose-R scientific experiment from portable multipurpose workstation in Zvezda Plane II; Kontur science hardware (ROKVISS); TV camera from Rassvet module. Performed Test experiment to check for microorganisms or contamination underneath insulation on the Russian ISS segment. Cosmonauts failed to relocate TV camera due to interference from insulation at installation location. Nicholas Patrick works on the exterior of the Cupola during the third EVA of the STS-130 mission, February 17, 2010. Installed an experimental communication antenna on Zvezda 's nadir side, removed and stowed a failed plasma pulse generator experiment apparatus and a material exposure experiment from Zvezda, and installed a docking TV camera on the Rassvet module. Installed two experiments for Earth seismic and lightning observations on the Zvezda module, removed two material exposure experiment panels from the exterior of the Zarya module, and jettisoned a foot restraint overboard. Drew and Bowen installed a power extension cable between the Unity and Tranquility nodes to provide a contingency power source should it be required. The spacewalkers then moved the failed ammonia pump module that was replaced in August from its temporary location to the External Stowage Platform 2 adjacent to the Quest airlock. Drew and Bowen then installed a wedge under a camera on the S3 truss to provide clearance from the newly installed ELC-4. They next replaced a guide for the rail cart system used for moving the station robotic arm along the truss. The guides had been removed when astronauts were performing work on the station's starboard Solar Alpha Rotary Joint (SARJ), which rotates the solar arrays to track the sun. The final task was to "fill" a special bottle with the vacuum of space for a Japanese education payload. The bottle will be part of a public museum exhibit. Drew removed thermal insulation from a platform, while Bowen swapped out an attachment bracket on the Columbus module. Bowen then installed a camera assembly on the Dextre robot and removed insulation from Dextre's electronics platform. Drew installed a light on a cargo cart and repaired some dislodged thermal insulation from a valve on the truss. Retrieved two MISSE 7 experiments. Installed new package of MISSE 8 experiments on ELC-2. Installed jumpers between segments on left-side truss for ammonia refills; vented nitrogen from ammonia servicer; began installation of external wireless communication antenna on Destiny laboratory to provide wireless communication to ELCs on truss. Installation postponed due to bad CO2 sensor in Chamitoff's space suit. Refilled Port 6 (P5) radiators with ammonia. Finished venting early ammonia system. Lubricated port SARJ and parts of ISS' Dextre robot. Installed grapple bars on port radiators. Installed grapple fixture on Zarya module to support robotic operations. Installed additional cables to provide backup power to the Russian portion of the space station. Finished installation of wireless video system begun in EVA 1. Stowed OBSS on right-side truss. Retrieved grapple from left-side truss to replace grapple currently on boom. Released restraints from one of Dextre's spare arms. Replaced thermal insulation on spare gas tank for the Quest airlock. ISS assembly completed. Retrieved a failed ammonia pump module from the External Stowage Platform 2 and secured it in the Shuttle payload bay for returning to Earth. The Robotics Refueling Mission (RRM) payload was removed from the Shuttle payload bay and installed on a platform on the ISS. The two also retrieved a material science experiment, freed a stuck wire at a power grapple fixture, installed thermal covers at PMA-3 and reconfigured external equipment. Deployed the ARISSat-1 amateur radio satellite, installed experiment packages on the exterior of the Russian segment, removed unneeded antennas from the Poisk module, and made photograph documentation. Original task of relocating a Strela crane deferred. Relocated the Strela-1 crane from the Pirs module to the Poisk module. Also installed the Vinoslivost Materials Sample Experiment and collected a test sample from underneath the insulation on the Zvezda service module to search for any signs of living organisms. Relocated the Strela-2 crane from the Pirs module to the Zarya module. Also deployed the Sfera-53 passive air density calibration satellite, installed five micro-meteoroid debris shields on the "Zvezda" module and retrieved external experiments. Connected two power cables between the US segment and the Russian segment on the ISS; removed and replaced Main Bus Switching Unit (MBSU) 1. The crew have difficulty in removing connecting bolts of the old MBSU, and were unable to tighten up the bolts for the new unit. The new MBSU was tied down for future trouble-shooting, with all other tasks deferred to a future EVA. Third-longest EVA in history. Installed the new MBSU unit, working around difficulty with one of the bolts; replaced one of the cameras mounted on the CanadArm. During this spacewalk, Sunita Williams broke Peggy Whitson's record for most total time spacewalking by a woman. Reconfigured and isolated a leak in the ammonia cooling system of power channel 2B on the P6 truss by-passing a leaking cooling loop and re-connecting jumpers to an unused loop of the Early External Thermal Control System (EETCS), and by re-deploying the trailing Thermal Control Radiator of the system. Installed the Obstanovka plasma waves and ionosphere experiment to the exterior of the Zvezda service module. Also replaced a faulty retro-reflector device used as navigational aids for the Automatic Transfer Vehicle and retrieved the Biorisk microbe exposure experiment. An attempt to retrieve the Vinoslivost materials sample experiment failed when it was accidentally dropped while being taken back to the Pirs module airlock. Replaced the 2B Pump Flow Control Subassembly (PFCS) on the Port 6 truss in attempting to locate the source of an ammonia coolant leak on the Port 6 truss Photo Voltaic Thermal Control System (PVTCS). Replaced a fluid flow regulator on the Zarya module, testing of the Kurs docking system on the station ahead of the arrival of a new Russian module, installing the “Indicator” experiment, installing gap spanners on to the outside of the station and photographing the multilayer insulation (MLI) protecting the Russian segment from micrometeoroids and taking samples from the exterior surface of the pressure hull underneath the MLI to identify signs of pressure hull material microscopic deterioration. Replaced a failed Space-to-Ground Transmitter Receiver Controller and the Mobile Base Camera Light Pan-Tilt Assembly, retrieved the MISSE-8 and ORMatE-III experiments, photographed the AMS-02, moved two Radiator Grapple Bars to either sides of the truss, routed power cables to support the addition of the new Russian MLM and installed a multi-layer insulation cover to protect the docking interface of PMA-2. Installed a Y-bypass jumper on power lines on the Z1 truss, routing 1553 data cables for a grapple fixture and Ethernet cables for a future Russian station module. The spacewalk was then cut short after Parmitano reported excess water leaking inside his helmet. Routed power and ethernet cables for later attachment to the future Nauka module. Also installed connectors between modules and a material science experiment. Removed a laser communication and installed an EVA work station and camera pointing platform outside the Zvezda service module, inspection and tightening of various antenna covers on Zvezda, and installed new spacewalk aids. Took the Olympic torch for the 2014 Winter Olympic Games to the outside of ISS. They also continued work on an extravehicular activity workstation and biaxial pointing platform by removing launch brackets and bolts, as well as retrieving an experimental package. The planned installation of a foot restraint on the mounting seat of the workstation was deferred to a future spacewalk after the spacewalkers noticed some issues with its alignment. Removed ammonia fluid lines from Active Thermal Control System pump module; removed pump module from starboard truss and stowed it on Payload Orbital Replacement Unit Accommodation. Retrieved spare ammonia pump module, installed it on starboard truss, and connected it to Loop A of Active Thermal Control System. Attempted installation of 2 HD cameras for commercial Earth observation on the outside of the Zvezda module, cancelled after one of the cameras failed to provide data to the ground during testing. Also installed and jettisoned experimental equipment outside the Russian segment. Longest Russian EVA in history. retrieved СКК #2-СО cassette container from DC-1. Replaced failed Multiplexer/Demultiplexer (MDM) unit on S0 truss; also removed two lanyards from Secondary Power Distribution Assembly (SPDA) doors. Installed an automated phased antenna array used for the Russian command and telemetry system, relocated a part of the Obstanovka experiment that monitors charged particles and plasma in Low Earth Orbit, verifying the correct installation of the universal work platform (URM-D), taking samples from one of Zvezda's windows, and jettisoning an experiment frame. Released Chasqui-1 cubesat into space; installed experiment packages (EXPOSE-R2 biological experiment, Plume Impingement and Deposit Monitoring unit), retrieved experiments (Vinoslivost materials exposure panel, Biorisk biological experiment), replaced cassette on SKK experiment and attached a handrail on an antenna. Re-located a failed pump module to a permanent stowage position, installed a back-up power supply for the Mobile Transporter and replaced a light on the robotic arm. Replaced failed sequential shunt unit (SSU) for 3A power system, relocated articulating portable foot restraint/tool stanchion (APFR/TS), removed camera port (CP) 7, relocated wireless video system external transceiver assembly (WETA) from CP8 to CP11, installed external TV camera group at CP8. Removed and jettisoned Radiometriya experiment from Zvezda Plane II, removed EXPOSE-R experiment protective cover, took surface samples from Pirs extravehicular hatch 2 window (TEST experiment), removed and jettisoned two KURS attennas 2ACф1-1 and 2ACф1-2 from Poisk, photographed exterior of ISS Russian segment. For spacewalks that took place from the beginning of 2015 on, see List of spacewalks since 2015. ^ Wade, Mark (2008). "Mir EO-28". Encyclopedia Astronautica. Archived from the original on 2009-08-03. Retrieved 2009-01-18. ^ NASA (1999). "STS-101 Day 3 Highlights". NASA. ^ NASA (2000). "STS-101 Day 4 Highlights". NASA. ^ NASA (2000). "STS-106 Day 3 Highlights". NASA. ^ NASA (2000). "STS-92 Day 5 Highlights". NASA. ^ NASA (2000). "STS-92 Report #11". NASA. ^ NASA (2000). "STS-92 Day 7 Highlights". NASA. ^ NASA (2000). "STS-92 Day 8 Highlights". NASA. ^ NASA (2000). "STS-92 Extravehicular Activities". NASA. ^ NASA (2000). "STS-97 Extravehicular Activities". NASA. ^ NASA (2000). "STS-97 Day 4 Highlights". NASA. ^ NASA (2000). "STS-97 Day 6 Highlights". NASA. ^ NASA (2000). "STS-97 Day 8 Highlights". NASA. ^ NASA (2001). "STS-98 Day 4 Highlights". NASA. ^ Boeing/NASA/United Space Alliance (2001). "Three Space Walks Will Add Sophisticated Laboratory". Shuttle Press Kits. Archived from the original on January 6, 2009. ^ NASA (2001). "STS-98 Day 6 Highlights". NASA. ^ NASA (2001). "STS-98 Day 8 Highlights". NASA. ^ NASA (2001). "STS-102 Day 4 Highlights". NASA. ^ NASA (2001). "STS-102 Day 6 Highlights". NASA. ^ NASA (2001). "STS-100 Day 4 Highlights". NASA. ^ NASA (2001). "STS-100 Day 6 Highlights". NASA. ^ NASA (2001). "ISS Status Report #01-18 Friday, June 9, 2001 - Expedition Two Crew". NASA. ^ a b Jim Banke (2001). "First spacewalk concludes". Space.com. Archived from the original on 2009-02-13. ^ Boeing/NASA/United Space Alliance (2001). "STS-104 Spacewalks: Installing a Spacewalking Portal". Shuttle Press Kits. Archived from the original on 2009-01-19. ^ a b c NASA (2001). "STS-104 Extravehicular Activities". NASA. ^ NASA (2001). "STS-104". NASA. ^ Todd Halvorson (2001). "Quest Airlock Makes Orbital Debut as Astronauts Wrap Up Station Construction Work". Space.com. Archived from the original on 2009-02-13. ^ Jim Banke (2001). "Historic milestone at Alpha". Space.com. Archived from the original on May 23, 2009. ^ a b NASA (2001). "STS-105 Extravehicular Activities". NASA. ^ a b NASA/Boeing/United Space Alliance (2001). "Two Spacewalks to Lay Groundwork for Future ISS Construction". Shuttle Press Kit. Archived from the original on 2009-01-07. ^ a b c d NASA (2001). "Expedition Three Spacewalks". NASA. ^ NASA (2001). "STS-108 Extravehicular Activities". NASA. ^ Jim Banke (2001). "STS-108 Mission Update Archive". Space.com. Archived from the original on 2008-07-04. ^ NASA (2001). "STS-108, Mission Control Center Status Report #11". NASA. Archived from the original on 2009-02-16. ^ a b c NASA (2002). "Expedition Four Spacewalks". NASA. ^ NASA (2002-03-04). "STS-109 Mission Status Report #8". NASA. Retrieved January 12, 2009. ^ NASA (2002-03-05). "STS-109 Mission Status Report #10". National Aeronautic and Space Administration. Retrieved 2009-01-12. ^ NASA (2002). "STS-109 Mission Status Report #12". National Aeronautic and Space Administration. Retrieved January 13, 2009. ^ NASA (2002). "STS-109 Mission Status Report #14". National Aeronautic and Space Administration. Retrieved January 13, 2009. ^ NASA (2002). "STS-109 Mission Status report #16". National Aeronautic and Space Administration. Retrieved January 13, 2009. ^ a b c d NASA (2002). "STS-110 Extravehicular Activities". NASA. ^ NASA (2002). "STS-110, Mission Control Center Status Report #17". NASA. ^ a b c NASA (2002). "STS-111 Extravehicular Activities". NASA. ^ NASA (2002). "STS-111, Mission Control Center Status Report # 10". NASA. ^ NASA (2002). "STS-111, Mission Control Center Status Report # 14". NASA. ^ NASA (2002). "STS-111, Mission Control Center Status Report # 18". NASA. ^ a b NASA (2002). "Expedition Five Spacewalks". NASA. ^ a b c NASA (2002). "STS-112 Extravehicular Activities". NASA. ^ NASA (2002). "STS-112 Mission Control Center Status Report #7". NASA. ^ NASA (2002). "STS-112 Mission Control Center Status Report #11". NASA. ^ NASA (2002). "STS-112 Mission Control Center Status Report #15". NASA. ^ a b c NASA (2002). "STS-113 Extravehicular Activities". NASA. ^ NASA (2002). "STS-113 Mission Control Center Status Report # 7". NASA. ^ NASA (2002). "STS-113 Mission Control Center Status Report # 11". NASA. ^ NASA (2002). "STS-113 Mission Control Center Status Report # 15". NASA. ^ a b NASA (2003). "Expedition Six Spacewalks". NASA. ^ NASA (2004). "Expedition 8 Spacewalks". NASA. ^ a b c d NASA (2004). "Expedition 9 Spacewalks". NASA. ^ NASA (2004). "International Space Station Status Report #04-32". NASA. ^ NASA (2004). "International Space Station Status Report #04-36". NASA. ^ NASA (2004). "International Space Station Status Report #04-43". NASA. ^ NASA (2004). "International Space Station Status Report #04-50". NASA. ^ a b NASA (2005). "Expedition 10 Spacewalks". NASA. ^ NASA (2005). "International Space Station Status Report #05-4". NASA. ^ NASA (2005). "International Space Station Status Report #05-16". NASA. ^ NASA (2005). "STS-114 MCC Status Report #09". NASA. ^ NASA (2005). "STS-114 MCC Status Report #13". NASA. ^ Tariq Malik (2005). "Shuttle Astronauts Repair ISS Gyroscope in Second Spacewalk". Space.com. ^ NASA (2005). "STS-114 MCC Status Report #17". NASA. ^ NASA (2005). "Station Crew Completes Spacewalk". NASA. ^ NASA (2005). "International Space Station Status Report #05-40". NASA. Archived from the original on 2009-02-13. ^ NASA (2005). "International Space Station Status Report #05-55". NASA. Archived from the original on 2009-02-13. ^ NASA (2006). "Crew Back in Station After Spacewalk". NASA. ^ NASA (2006). "Station Crew Winds Up Successful Spacewalk". NASA. ^ NASA (2006). "STS-121 MCC Status Report #09". NASA. ^ NASA (2006). "STS-121 MCC Status Report #13". NASA. ^ NASA (2006). "STS-121 MCC Status Report #17". NASA. ^ NASA (2006). "Station Crewmen Back Inside After Spacewalk". NASA. ^ NASA (2006). "STS-115 MCC Status Report #07". NASA. ^ NASA (2006). "STS-115 MCC Status Report #09". NASA. ^ NASA (2006). "STS-115 MCC Status Report #13". NASA. ^ NASA (2006). "Spacewalkers Tee Off on Science, Mechanics". NASA. ^ NASA (2006). "STS-116 MCC Status Report #07". NASA. ^ NASA (2006). "STS-116 MCC Status Report #11". NASA. ^ NASA (2006). "STS-116 MCC Status Report #15". NASA. ^ NASA (2006). "STS-116 MCC Status Report #19". NASA. ^ NASA (2007). "Station Crew Members Wind Up Successful Spacewalk". NASA. ^ NASA (2007). "Crew Completes Scheduled Spacewalk Tasks, and More". NASA. ^ NASA (2007). "Spacewalkers Successfully Wrap Up Record Series". NASA. ^ NASA (2007). "Spacewalkers Successfully Retract Progress Antenna". NASA. ^ NASA (2007). "Spacewalk Complete, Debris Panels Installed". NASA. ^ NASA (2007). "Cosmonauts Wrap Up Debris-Panel Spacewalk". NASA. ^ NASA (2007). "STS-117 MCC Status Report #07". NASA. ^ NASA (2007). "STS-117 MCC Status Report #11". NASA. ^ Chris Bergin (2007). "Success filled day for STS-117's EVA-3". NASA SpaceFlight.com. Archived from the original on 2009-01-31. ^ NASA (2007). "STS-117 MCC Status Report #19". NASA. ^ NASA (2007). "Station Crew Winds Up Ammonia Reservoir Jettison Spacewalk". NASA. Retrieved 2007-10-04. ^ William Harwood - CBS News (2007). "Shuttle Endeavour readied for rollout to launch pad". Spaceflightnow.com. Archived from the original on 2009-01-14. Retrieved 2007-10-04. ^ NASA (2007). "STS-118 MCC Status Report #07". NASA. ^ NASA (2007). "STS-118 MCC Status Report #11". NASA. ^ NASA (2007). "STS-118 MCC Status Report #15". NASA. ^ NASA (2007). "STS-118 MCC Status Report #21". NASA. ^ Bergin, Chris (August 18, 2007). "Endeavour to undock Sunday - spacewalkers observe Hurricane Dean". NASASpaceflight.com. Archived from the original on January 31, 2009. Retrieved January 23, 2009. ^ NASA (2007). "STS-120 MCC Status Report #8". NASA. ^ NASA (2007). "STS-120 MCC Status Report #12". NASA. ^ NASA (2007). "STS-120 MCC Status Report #16". NASA. ^ NASA (2007). "STS-120 MCC Status Report #24". NASA. ^ NASA (2008). "Expedition 16 EVA Mission Status Briefing Materials". NASA. ^ NASA (2007). "ISS On-Orbit Status 11/09/07". NASA. Archived from the original on 2009-07-30. ^ NASA (2007). "ISS On-Orbit Status 11/20/07". NASA. Archived from the original on 2009-02-13. ^ NASA (2007). "ISS On-Orbit Status 11/24/07". NASA. Archived from the original on 2008-04-20. ^ Associated Press (December 18, 2007). "Astronauts Take Spacewalk to Inspect Defective Solar Wing Mechanisms". Fox News. Archived from the original on January 12, 2009. Retrieved 2007-12-18. ^ NASA (2007). "Spacewalkers Find No Solar Wing Smoking Gun". NASA. Retrieved 2007-12-18. ^ Tariq Malik (2007). "Space Station Commander Breaks Spacewalking Record". Space.com. Archived from the original on 2007-06-13. Retrieved 2007-12-18. ^ Other records: Whitson became the female astronaut with the most EVAs (five) and the most time spent in EVA, with a total of 32 hours, 36 minutes. ^ NASA (2008). "ISS On-Orbit Status 01/30/08". NASA. Archived from the original on 2009-02-13. ^ NASA (2008). "STS-122 MCC Status Report #09". NASA. ^ NASA (2008). "STS-122 MCC Status Report #13". NASA. ^ NASA (2008). "STS-122 MCC Status Report #17". NASA. ^ NASA (2008). "STS-123 MCC Status Report #07". NASA. ^ NASA (2008). "STS-123 MCC Status Report #11". NASA. ^ NASA (2008). "STS-123 MCC Status Report #15". NASA. ^ NASA (2008). "STS-123 MCC Status Report #21". NASA. ^ NASA (2008). "STS-123 MCC Status Report #25". NASA. ^ NASA (2008). "STS-124 EVA Briefing Graphics". NASA. ^ NASA (2008). "STS-124 MCC Status Report #07". NASA. ^ NASA. "STS-124 MCC Status Report #11". NASA. ^ a b NASA (2008-05-29). "STS 124 Press Kit" (PDF). NASA. Retrieved 2008-05-29. ^ NASA (2008). "ISS On-Orbit Status 07/10/08". NASA. Archived from the original on 2009-02-13. ^ Marcia Dunn for Associated Press (2008-07-11). "Astronauts handle explosives on daring spacewalk". Discovery. Archived from the original on January 9, 2009. Retrieved 2009-01-08. ^ NASA (2008-07-15). "Russian Spacewalkers Outfit Station's Exterior". NASA. ^ David Barboza (September 28, 2008). "Chinese Astronaut Takes Nation's First Spacewalk". The New York Times. Retrieved November 9, 2008. ^ Stephen Clark (September 28, 2008). "Shenzhou spacecraft lands safely after three-day flight". Spaceflight Now. Archived from the original on January 3, 2009. Retrieved January 3, 2008. ^ NASA RSS (2008). "Astronauts Resume Spacewalk After Tools Lost". NASA. Retrieved November 18, 2008. ^ William Harwood for CBS News (2008). "Bag of tools escapes from spacewalker and floats away". Spaceflightnow.com. Archived from the original on January 4, 2009. Retrieved November 18, 2008. ^ William Harwood for CBS News (2008). "Spacewalk No. 2 ends". Spaceflightnow.com. Archived from the original on January 4, 2009. Retrieved November 20, 2008. ^ NASA (November 20, 2008). "STS-126 MCC Status Report #13". NASA. Retrieved 2008-11-21. ^ William Harwood for CBS News (2008). "One trundle bearing left for final spacewalk". Spaceflightnow.com. Archived from the original on January 4, 2009. Retrieved November 22, 2008. ^ William Harwood for CBS News (2008). "Spacewalk No. 3 ends". Spaceflightnow.com. Archived from the original on January 3, 2009. Retrieved November 22, 2008. ^ William Harwood for CBS News (November 24, 2008). "Spacewalk No. 4 ends". Spaceflightnow.com. Archived from the original on January 2, 2009. Retrieved November 24, 2008. ^ Associated Press (2008). "US, Russian space station crew conduct spacewalk". Seattle Post-Intelligencer. Archived from the original on January 1, 2009. Retrieved December 23, 2008. ^ Harwood, William (March 10, 2009). "Spacewalk outside the space station a success". Space Flight Now. Archived from the original on 2009-03-12. Retrieved 2009-03-12. ^ NASA (March 19, 2009). "STS-119 MCC Status Report #08". NASA. Retrieved March 19, 2009. ^ NASA (March 21, 2009). "STS-119 MCC Status Report #12". NASA. Retrieved 2009-03-21. ^ NASA (March 23, 2009). "STS-119 MCC Status Report #16". NASA. Retrieved 2009-03-23. ^ William Harwood for CBS News (May 14, 2009). "Replacement Hubble science computer installed". Spaceflightnow.com. Retrieved May 14, 2009. ^ William Harwood for CBS News (May 14, 2009). "Newly installed camera passes 'aliveness' test". Spaceflightnow.com. Retrieved May 14, 2009. ^ Chris Bergin (May 14, 2009). "EVA-1 kicks off spacewalk marathon for STS-125's servicing of Hubble". NASA Spaceflight.com. Retrieved May 14, 2009. ^ William Harwood for CBS News (May 15, 2009). "Spacewalk No. 2 ends". Spaceflightnow.com. ^ NASA (May 15, 2009). "STS-125 MCC Status Report #09". NASA. ^ NASA (May 16, 2009). "STS-125 MCC Status Report #11". NASA. ^ NASA (May 17, 2009). "STS-125 MCC Status Report #13". NASA. ^ NASA (May 11, 2009). "STS-125 MCC Status Report #15". NASA. ^ Aviation Week (May 18, 2009). "Hubble Wraps Final Spacewalk". Aviation Week. ^ William Harwood for CBS News (May 18, 2009). "Astronauts install insulation panels to complete servicing". Spaceflightnow.com. ^ William Harwood for CBS News (June 5, 2009). "Successful spacewalk ends". Spaceflightnow.com. Retrieved June 5, 2009. ^ NASA (March 2009). "Expedition 20 Press Kit" (.pdf). NASA. Retrieved June 4, 2009. ^ David Korth, Expedition 20 Spacewalk Flight Director (June 4, 2009). "Expedition 20 Spacewalk Briefing Materials". NASA. Retrieved June 10, 2009. ^ "Crew Completes First Expedition 22 Spacewalk". NASA. January 15, 2010. Retrieved January 15, 2010. ^ Chris Bergin. "Opening ISS spacewalk to replace coolant pump completed". NASASpaceflight.com. Retrieved 2010-08-07. ^ "Russian Cosmonauts Returned to the ISS after EVA". Russian Federal Space Agency. 2010-11-16. Retrieved 2010-11-16. ^ NASA (2010-11-15). "Crew completes spacewalk". Retrieved 2010-11-16. ^ Pete Harding (2011-01-21). "ISS Crew open 2011 spacewalk marathon with 27th Russian EVA". Retrieved 2011-03-06. ^ NASA (2011-01-21). "Cosmonauts Perform 27th Russian Space Station Spacewalk". Retrieved 2011-03-06. ^ Pete Harding (2011-02-16). "Cosmonauts complete Russian Spacewalk on ISS". Retrieved 2011-03-06. ^ NASA (2011-02-16). "Cosmonauts Perform 28th Russian Space Station Spacewalk". Retrieved 2011-03-06. ^ Pete Harding (2011-08-03). "Cosmonauts conclude eventful Russian Stage spacewalk on ISS". Retrieved 2012-06-23. ^ NASA (2011-08-04). "Cosmonauts Wrap Up Spacewalk". Retrieved 2012-06-23. ^ Pete Harding (2012-02-16). "Cosmonaut duo complete Russian spacewalk outside ISS". Retrieved 2012-06-23. ^ NASA (2012-02-16). "Spacewalkers Move Crane, Install Experiment". Retrieved 2012-06-23. ^ Pete Harding (2012-08-20). "Russian cosmonaut duo complete a highly successful spacewalk on ISS". Retrieved 2012-08-20. ^ NASA (2012-08-20). "Cosmonauts Complete First Expedition 32 Spacewalk". Retrieved 2012-08-20. ^ Pete Harding (2012-08-30). "Astronaut duo complete challenging first post-Shuttle US spacewalk on ISS". Retrieved 2012-08-30. ^ Pete Harding (2013-04-19). "Cosmonauts successfully conclude Russian spacewalk". Retrieved 2013-04-19. ^ NASA (2013-04-19). "Spacewalkers Deploy Plasma Experiment, Install Navigational Aid". Retrieved 2013-04-19. ^ Pete Harding and Chris Bergin (2013-05-11). 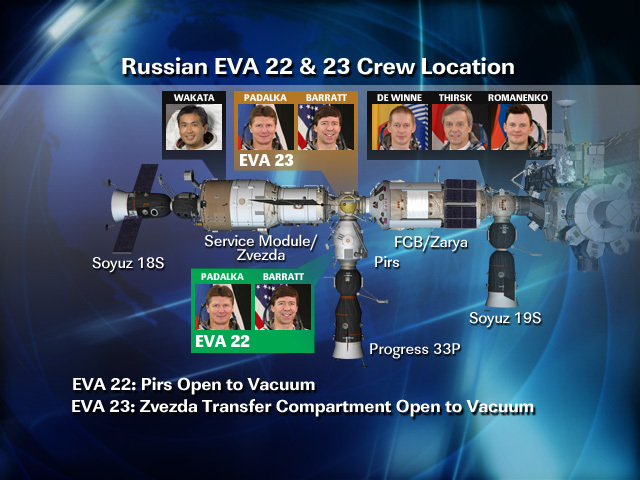 "Successful EVA likely to have resolved ammonia leak". Retrieved 2013-05-12. ^ NASA (2013-05-11). "Astronauts Complete Spacewalk to Repair Ammonia Leak". Retrieved 2013-05-12. ^ Chris Bergin (2013-06-24). "Russian duo complete ambitious ISS spacewalk". Retrieved 2013-06-25. ^ NASA (2013-06-24). "Cosmonauts Complete Spacewalk to Prepare Station for New Russian Lab". Retrieved 2013-06-25. ^ Chris Bergin (2013-07-09). "EVA-22: Cassidy and Parmitano complete ISS spacewalk". Retrieved 2013-07-10. ^ NASA (2013-07-09). "Station Astronauts Complete First of Two July Spacewalks". Retrieved 2013-07-10. ^ Miriam Kramer (2013-07-16). "NASA Cuts Spacewalk Short After Water Leak Inside Astronaut's Spacesuit". Retrieved 2013-07-16. ^ Pete Harding (2013-07-16). "EVA-23 terminated due to Parmitano EMU issue". Retrieved 2013-07-17. ^ NASA (2013-07-16). "Tuesday Spacewalk Ended Early". Retrieved 2013-07-17. ^ Chris Bergin (2013-08-16). "Russian EVA breaks record – EMU troubleshooting continues". Retrieved 2013-08-16. ^ NASA (2013-08-16). "Spacewalkers Wire Up Station for Future Lab". Retrieved 2013-08-16. ^ Chris Bergin (2013-08-22). "Russian duo complete EVA-35 – Luca recalls EVA drama". Retrieved 2013-08-22. ^ NASA (2013-08-22). "Spacewalkers Install Camera Platform, Inspect Station". Retrieved 2013-08-22. ^ Chris Bergin (2013-11-09). "Troublesome ISS EVA conducts Olympic torch relay in space". Retrieved 2013-11-11. ^ NASA (2013-11-09). "Olympic Torch Highlights Station Spacewalk". Retrieved 2013-11-11. ^ NASA (2013-12-21). "Space Station Crew Removes Ammonia Pump; Next Spacewalk Set for Tuesday". Retrieved 2013-12-21. ^ NASA (2013-12-24). "Spacewalkers Complete Installation of Ammonia Pump Module". Retrieved 2013-12-24. ^ Robert Z. Pearlman (2013-12-24). "Spacewalking Astronauts Gift Space Station with Christmas Eve Cooling Pump Fix". Retrieved 2013-12-24. ^ NASA (2013-12-27). "Station Cosmonauts Complete Spacewalk to Deploy Cameras". Retrieved 2013-12-28. ^ Chris Bergin (2013-12-27). "Russian duo break EVA record – Main task suffers issue". Retrieved 2013-12-28. ^ "NASA ISS On-Orbit Status 27 January 2014". 2014-01-27. Retrieved 2014-01-29. ^ "Astronauts Complete Short Spacewalk to Replace Backup Computer". NASA. 2014-04-23. Retrieved 2014-04-24. ^ Pete Harding (2014-04-23). "Astronauts completed speedy EVA to replace failed EXT-2 MDM". NASASpaceflight.com. Retrieved 2014-04-24. ^ "Spacewalkers Complete Installation and Experiment Work". NASA. 2014-06-19. Retrieved 2014-06-20. ^ David Štula (2014-06-19). "EVA-38: Frustration morphs into success during Russian spacewalk". NASASpaceflight.com. Retrieved 2014-06-20. ^ "Station Spacewalkers Deploy Nanosatellite, Install and Retrieve Science". NASA. 2014-08-18. Retrieved 2014-08-18. ^ David Štula and Chris Bergin (2014-08-18). "Russian spacewalkers successfully complete science-oriented EVA". NASASpaceflight.com. Retrieved 2014-08-18. ^ "Wiseman and Gerst Complete First Spacewalk of Expedition 41". NASA. 2014-10-07. Retrieved 2014-10-08. ^ Pete Harding (2014-10-07). "EVA-27: Astronaut duo complete US spacewalk outside ISS". NASASpaceflight.com. Retrieved 2014-10-08. ^ "Station Spacewalkers Replace Power Regulator, Move Equipment". NASA. 2014-10-15. Retrieved 2014-10-15. ^ Pete Harding (2014-10-15). "American duo complete EVA to prepare ISS for commercial crew". NASASpaceflight.com. Retrieved 2014-10-15. ^ "Cosmonauts Complete Third October Spacewalk". NASA. 2014-10-22. Retrieved 2014-10-22. ^ David Štula (2014-10-24). "Russian EVA-40 concludes final ISS spacewalk of 2014". NASASpaceflight.com. Retrieved 2014-10-24. "Boomers collect artifacts, memories of NASA's heyday": Historical moonwalk information. This page was last edited on 16 March 2019, at 20:25 (UTC).